After giving shade for 80 to 90 years, the oldest Ficus tree at Fort Rosecrans National Cemetery “gave up the ghost” this month. 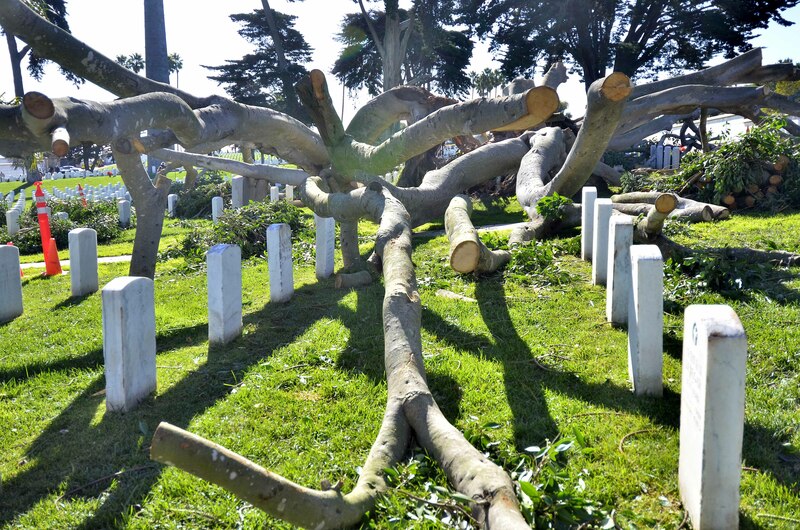 The stately sentry laid down its branches in a way that didn’t disturb the fallen heroes beneath it. 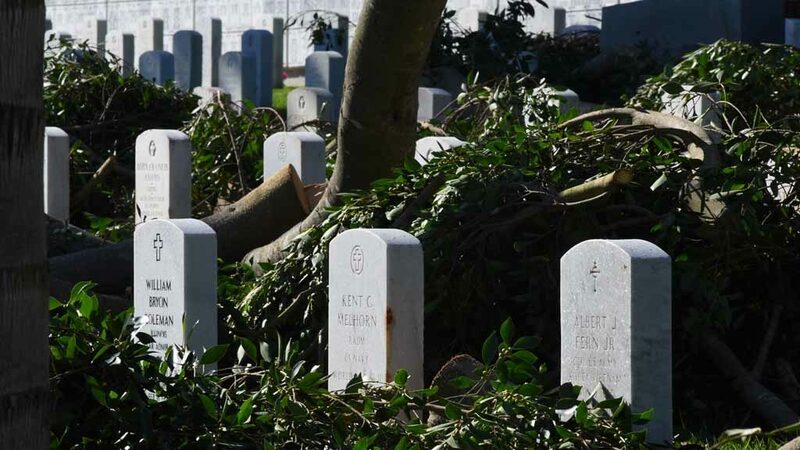 Heavy branches interwove white headstones Saturday as hundreds attending Wreaths Across America ceremonies noticed the cordoned off area. 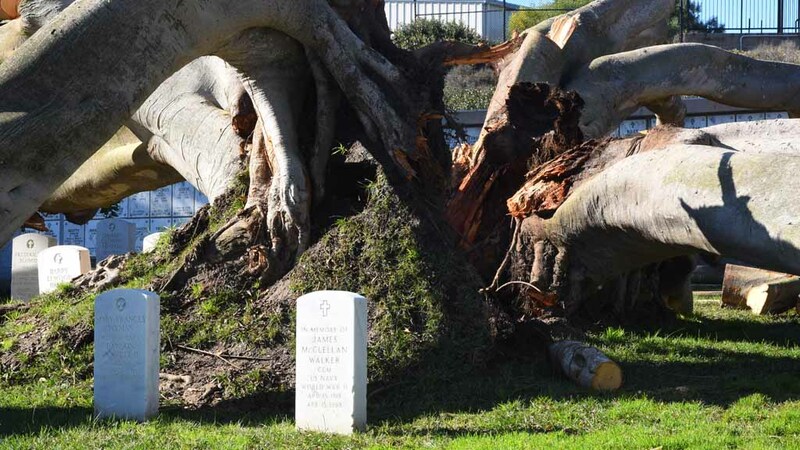 Fortunately, the tree didn’t injure anyone or do much damage as it collapsed over two nights in the often visited area, said Graham Wright, the cemetery’s assistant director. 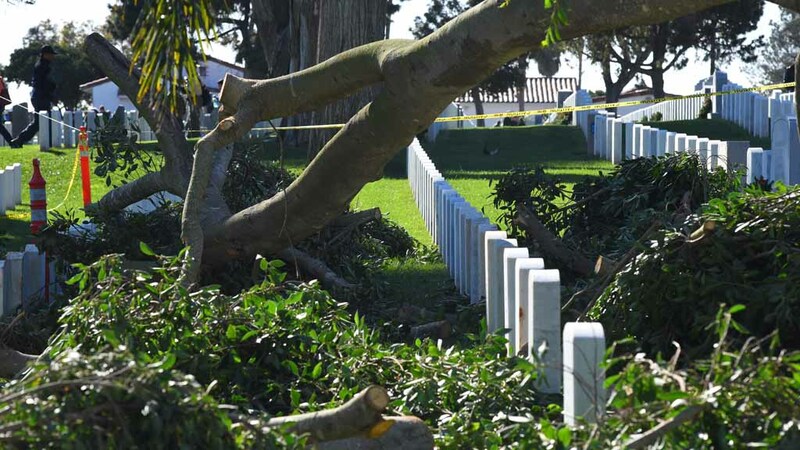 One headstone at the base was lifted and two private markers were knocked over. They will be replaced soon and the branches were expected to be removed by the end of the week, Wright said Monday. “It just came to the end of its life cycle; for lack of a better expression, it gave up the ghost,” Wright told Times of San Diego. The tree species, with branches growing out from the base, had rotted over the years. 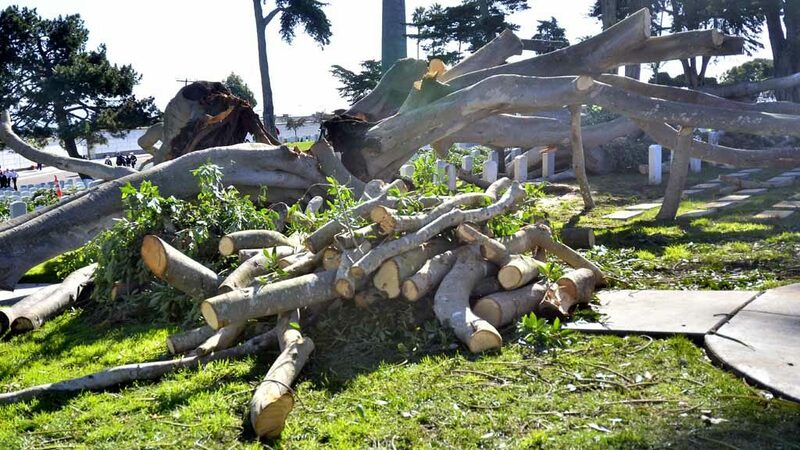 About 40 percent of the tree collapsed one night, and cemetery workers tried to see how they could save the remaining section, but it too fell last Monday, he said. “Thank goodness no one was in the cemetery at the time,” Wright said. 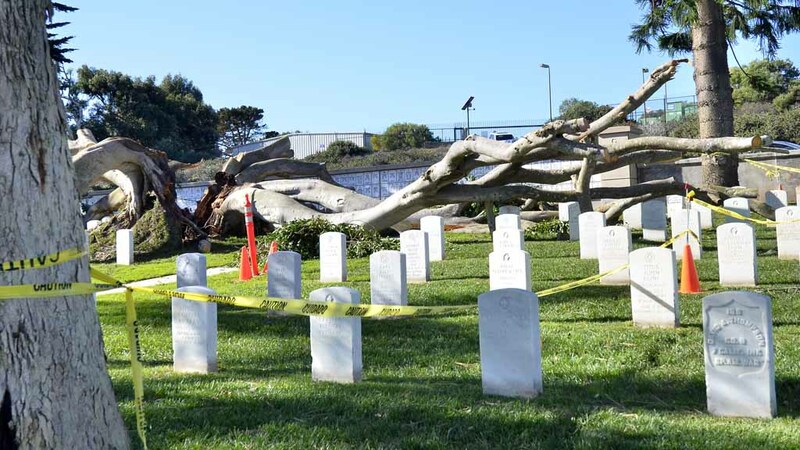 The 60- to 70-foot tree had just been trimmed of heavy branches to lighten the load in its canopy as part of annual maintenance, Wright said. But that wasn’t enough. 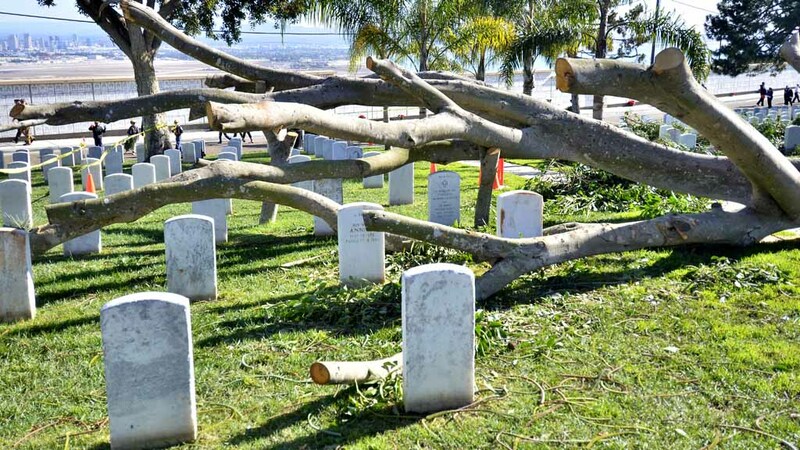 The base of the tree was large enough to nearly fill his office, Wright said. 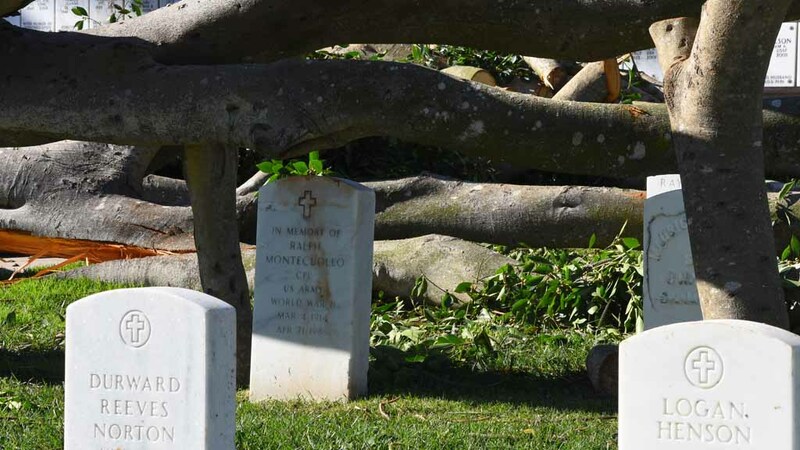 The tree dates to the earliest years of the federal graveyard, which became Fort Rosecrans National Cemetery in 1934. 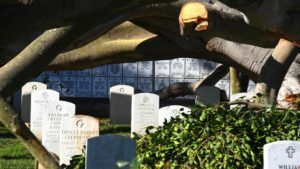 A burial ground since the 1840s, the Point Loma site is final resting place for U.S. soldiers who died at the Battle of San Pasqual in 1846, and for USS Bennington explosion victims of 1905. What happens to the remains of the tree? 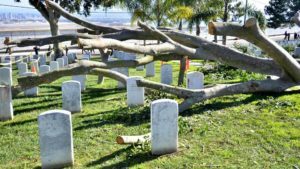 Wright said the removal contractor would take them back for chipping, and recycle the wood as mulch — possibly for return to Fort Rosecrans. But he has a spot in mind.